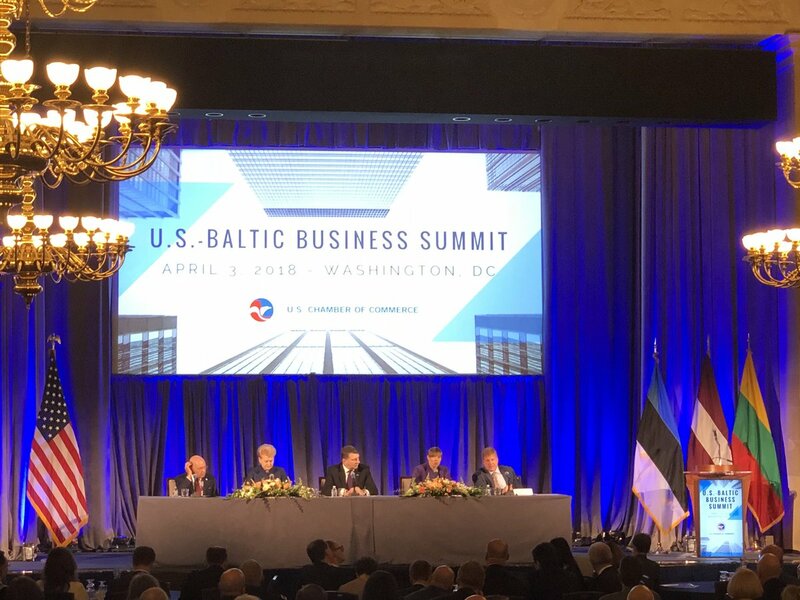 Washington, D.C. —Today in Washington, the presidents of Estonia, Latvia, and Lithuania will meet with President Donald Trump and leaders of the business community for the Baltic Summit where they will discuss cooperation across sectors, including the energy sector. The European heads of state will meet with President Trump in the morning, after which they’ll join industry leaders from the U.S. and the three Baltic states at the U.S. Chamber of Commerce for an afternoon of panel discussions and a keynote speech by Commerce Secretary Wilbur Ross. The Baltic Summit commemorates the 100th anniversary of the three countries’ independence from Russia and our strengthening alliance with the three NATO members. The meeting will highlight success stories from the U.S.-Baltic partnership. During the visit, Lithuanian President Dalia Grybauskaite will observe the signing of two memorandums of understanding--one between Texas-based Freeport LNG and Lithuania’s Klaipedos Nafta for regasification terminal cooperation, and one between Freeport LNG and Lithuania’s natural gas supply and trading company, Lietuvos Duju Tiekimas, for LNG supplies. The LNG market in the Baltic region has expanded over the past year. USEA-member Cheniere Energy, Inc. sent the first cargoes of LNG to Lithuania last fall in a move that began to change the geopolitics of a region otherwise reliant on Russia’s Gazprom. “We welcome the leaders from Estonia, Lativia and Lithuania and expect a fruitful visit as we continue our strong cooperation on energy development. “USEA has worked in the Baltic region with the U.S. Agency for International Development (USAID) for more than 25 years, when we started our Utility Partnership Program (UPP) to provide technical assistance to the electric utilities in Central and Eastern Europe after the Cold War. “The objective was to enable Eastern European countries to disconnect from the Soviet grid and interconnect with Western Europe. Under our partnership program, a utility from each country was paired with a U.S. utility whose consumers most reflected the culture of a particular European partner. “We have worked with Latvenergo in Latvia, Lietuvas Energija in Lithuania, and Eesti Energia in Estonia, among other utilities in the region, conducting exchange visits, seminars, and internships in both the U.S. and in each country. We have focused on general utility commercial operations including financial management, human resource management and customer service among other areas. “In 1991, two years after the fall of the Berlin Wall, the Soviet Union was dissolving, and the Baltic states were just trying to survive. USEA and USAID were trying to improve the individual republics’ electricity infrastructure and disconnect it from the Soviet grid, which was basic and rundown. “The vertically-integrated, state-owned utilities that were legacies of the Communist era were bankrupt when we arrived after the Cold War. They were cannibalizing their systems because they hadn’t been able to afford maintenance. “The energy sector and Baltic region has gotten much more sophisticated. So our focus has shifted from basic utility operations to more regional system planning. It has gotten more technical. We do software analysis, modeling, and planning, human resource management, customer service, financial management. The United States Energy Association (USEA) is the U.S. member of the World Energy Council (WEC), the energy body of the United Nations. USEA also serves as a bipartisan advisory organization that represents 150 members across the U.S. energy sector from the largest Fortune 500 companies to small energy consulting firms. USEA’s team of international energy specialists work with the U.S. Agency for International Development to build out energy infrastructure in developing countries.